See in Glossary. 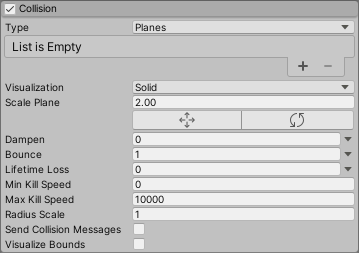 Use the first drop-down to define whether your collision settings apply to Planes or to the WorldThe area in your scene in which all objects reside. Often used to specify that coordinates are world-relative, as opposed to object-relative. See in Glossary. If you choose World, use the Collision Mode drop-down to define whether your collision settings apply for a 2D or 3D world. Planes popup Select Planes mode. Planes An expandable list of Transforms that define collision planes. See in Glossary as wireframe grids or solid planes. Scale Plane Size of planes used for visualization. Dampen The fraction of a particle’s speed that it loses after a collision. Bounce The fraction of a particle’s speed that rebounds from a surface after a collision. Lifetime Loss The fraction of a particle’s total lifetime that it loses if it collides. Min Kill Speed Particles travelling below this speed after a collision will be removed from the system. Max Kill Speed Particles travelling above this speed after a collision will be removed from the system. Radius Scale Allows you to adjust the radius of the particle collision spheres so it more closely fits the visual edges of the particle graphic. See in Glossary by the OnParticleCollision function. Visualize Bounds Renders the collision bounds of each particle as a wireframe shape in the Scene view. World popup Select World mode. Collision Mode 3D or 2D. Radius Scale Setting for 2D or 3D. 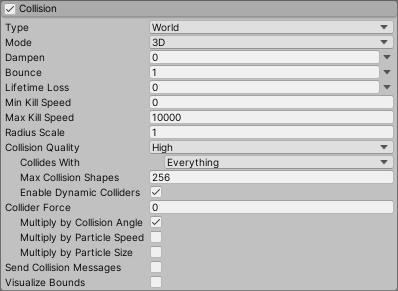 Collision Quality Use the drop-down to set the quality of particle collisions. This affects how many particles can pass through a collider. At lower quality levels, particles can sometimes pass through colliders, but are less resource-intensive to calculate. High When Collision Quality is set to High, collisions always use the physics system for detecting the collision results. This is the most resource-intensive option, but also the most accurate. Medium (Static Colliders) When Collision Quality is set to Medium (Static Colliders), collisions use a grid of voxels to cache previous collisions, for faster re-use in later frames. See World collisions, below, to learn more about this cache. The only difference between Medium and Low is how many times per frame the Particle System queries the physics system. Medium makes more queries per frame than Low. Note that this setting is only suitable for static colliders that never move. Low (Static Colliders) When Collision Quality is set to Low (Static Colliders), collisions use a grid of voxels to cache previous collisions, for faster re-use in later frames. See World collisions, below, to learn more about this cache. Collides With Particles will only collide with objects on the selected layers. See in Glossary take priority. Enable Dynamic Colliders Allows the particles to also collide with dynamic objects (otherwise only static objects are used). See in Glossary for further information on collider types). Check this option to include these collider types in the set of objects that the particles respond to in collisions. Uncheck this option and the particles only respond to collisions against static colliders. Voxel Size A voxel represents a value on a regular grid in three-dimensional space. When using Medium or Low quality collisions, Unity caches collisions in a grid structure. This setting controls the grid size. Smaller values give more accuracy, but cost more memory, and are less efficient. Note: You can only access this property when Collision Quality is set to Medium or Low. Collider Force Apply a force to Physics Colliders after a Particle collision. This is useful for pushing colliders with particles. Multiply by Collision Angle When applying forces to Colliders, scale the strength of the force based on the collision angle between the particle and the collider. Grazing angles will generate less force than a head-on collision. Multiply by Particle Speed When applying forces to Colliders, scale the strength of the force based on the speed of the particle. Fast-moving particles will generate more force than slower ones. Multiply by Particle Size When applying forces to Colliders, scale the strength of the force based on the size of the particle. Larger particles will generate more force than smaller ones. Send Collision Messages Check this to be able to detect particle collisions from scripts by the OnParticleCollision function. Visualize Bounds Preview the collision spheres for each particle in the Scene view. See in Glossary module enabled, particles can collide with objects in the Scene. A Particle System can be set so its particles collide with any Collider in the scene by selecting World mode from the pop-up. Colliders can also be disabled according to the layer they are on by using the Collides With property. The pop-up also has a Planes mode option which allows you to add a set of planes to the Scene that don’t need to have Colliders. This option is useful for simple floors, walls and similar objects, and has a lower processor overhead than World mode. See in Glossary themselves. The Gizmos can be shown as a wireframe grid or a solid plane, and can also be scaled. However, the scaling only applies to the visualization - the collision planes themselves extend infinitely through the Scene. When collisions are enabled, the size of a particle is sometimes a problem because its graphic can be clipped as it makes contact with a surface. This can result in a particle appearing to “sink” partway into a surface before stopping or bouncing. The Radius Scale property addresses this issue by defining an approximate circular radius for the particles, as a percentage of its actual size. This size information is used to prevent clipping and avoid the sinking-in effect. The Dampen and Bounce properties are useful for when the particles represent solid objects. For example, gravel will tend to bounce off a hard surface when thrown but a snowball’s particles might lose speed during a collision. Lifetime Loss and Min Kill Speed can help to reduce the effects of residual particles following a collision. For example, a fireball might last for a few seconds while flying through the air but after colliding, the separate fire particles should dissipate quickly. You can also detect particle collisions from a script if Send Collision Messages is enabled. The script can be attached to the object with the particle system, or the one with the Collider, or both. By detecting collisions, you can use particles as active objects in gameplay, for example as projectiles, magic spells and power-ups. See the script reference page for MonoBehaviour.OnParticleCollision for further details and examples. See in Glossary (values on a 3D grid) to cache previous collisions, for fast re-use in later frames. See in Glossary. Otherwise, it asks the physics system. If a collision is returned, it is added to the cache for fast querying on subsequent frames. This is an approximation, so some missed collisions might occur. You can reduce the Voxel Size value to help with this; however, doing so uses extra memory, and is less efficient. The only difference between Medium and Low is how many times per frame the system is allowed to query the physics system. Low makes fewer queries per frame than Medium. Once the per-frame budget has been exceeded, only the cache is used for any remaining particles. This can lead to an increase in missed collisions, until the cache has been more comprehensively populated.